The story on the pirate attack of a U.S. ship in Somalia this week provides a good example of when the timeline can be helpful. The graph shows the evolution of the story from the pirate takeover of the ship on April 10th to the release of the ship's captain on the 12th. 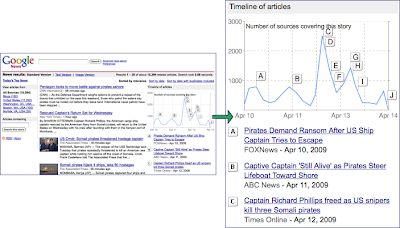 The timeline also shows the evolution of media attention and coverage of the story, with a peak of nearly 3000 indexed articles written when the standoff ended and the captain was freed. 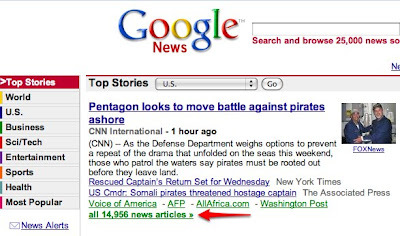 The timeline of articles is one of several features we're bringing to Google News in the coming months. Stay tuned for these updates as they come, and until then, see how actual news stories unfold using the timeline. When you visit Google News, you see the day's top news stories organized by section. You can then click through to any number of sources to read the news from different perspectives. Yet by their succinct nature, individual articles can only give partial snapshots of news stories that often develop over time, whether it's a couple of hours, days, or even weeks.